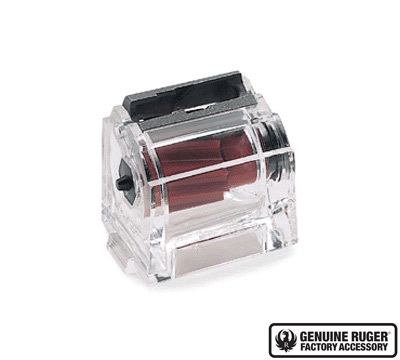 10-Round Rotary Magazine with Steel Feed - Clear. Works with any factory original 10/22® Rifle, SR-22® Rifle, 22 Charger™ Pistol, and .22 LR Ruger 77/22® Rifle. *Due to changes in the law effective October 1, 2013 Ruger is not able to sell magazines to CONNECTICUT residents. Ruger cannot bill to or ship this magazine to Brooklyn, Buffalo, New York City, or Rochester, New York. DO NOT ORDER THIS PRODUCT if you live in these cities. These are the best mags hands down! I have been fortunate enough to try most every mag available on the market. These are the only magazines that hold up to relentless, suppressed or unsuppressed, use. The black mags will fail after short time with suppressor use. None of the high capacity factory or aftermarket have held up more than a month. I dont believe the bad reviews, if theyre too tight width thats a stock issue. I exclusively run the clear mags, most with the Tri-Mag. I have not found anything that works better. I bought several of these for my Charger and they fit fine. I like the clear plastic so I can see how many rounds. No feed issues or jams. Been using them for 2 months. As others have noted the clear magazines are much wider than the black ones. While these clear magazines will fit my older 10/22 just fine they WILL NOT fit my American Rimfire! The whole point of having both the American and the 10/22 is magazine commonality but if I have to separate my magazines by which gun they will fit then that convenience is lost. I dont know why it would be so hard to make a clear magazine with the same dimensions as the black ones. Ruger was kind enough to replace my clear magazines with black ones. I ordered 3 of the clear ones off midway. They have the ruger brand listed on the bottom. 2 of the 3 are too wide. The third fits fine. Had to get a dremel and grind them down. It just seem to be a quality control issue. Letting ones that are out of spec out the door. OK but not as good as my black mag. This clear 10 round mag. is very usable but does not drop out of the gun without a little assistance from above. It is a little harder to press each round into the mag when loading than it is with my original black mag. I purchased this because it looks cool. I bought this magazine and never opened for 7 months until squirrel opener. I found out that its hard to insert bullets in, I thought it was just me and I told my brother-in-law who was hunting with me to try it inserting bullets in. Well what do you know I got a bad magazine. I sticking with the black magazine for now. I ordered six of these. Only two fit. The other four are too wide. All of six of my black mags fit perfectly. At first I thought they must be 22mag versions...but no, they are 22LR. Poor QC on the cleats. Check for before purchasing. Ruger’s 10 round clear magazines works great for seeing how many rounds are loaded. They work the same as the standard model for all of my rifles including one that I bought in 1977. A spare magazine in 1977 cost $8 dollars and mine still works fine. I added a few more over the years and none have failed. I guess that means I would have been smart to bought more. Taking them apart and cleaning them is tricky. I read this is not highly recommended. However, I was dumb and stomped one of mine into the mud and it is still working fine after I cleaned it about 20 years ago. I dont know what the reason is for any negative reviews regarding fit and function of these mags. I bought 3 to add to the 3 black ones I have for two rifles. They work exactly like the black ones in both rifles. One rifle has the standard wood stock and one has a nylon stock. Both work but the nylon stock sticks just a tiny bit more with BOTH clear and black mags. The wood stock doesnt stick with either mag in the least. This tells me that both the clear and the black mags are the exact same size. I bought 10/22 50th anniversary edition new, it came with two black 10 round mags. I do steel plate shooting where we are timed. We need 5 mags with 7 rounds. I bought the only mag the shop had in stock, it was clear. I bought two more black at another shop. The clear fits my 10/22 perfect, one push on the release and any of my 5 mags fall right out without any problem. I want to get more of the clear because you can see what is left. These fit in my old 10-22 but not my new model & dont feed reliably. Like the title says, I have 3 of these, which appear to have been made by more than one manufacturer as the markings and logo stamp placement are different, and they fit a bit tightly in my older blued 10-22 but not at all my newer stainless model. They also tend to jam in the older 10-22 that they do fit in; a minimum of 1 or 2 jams per the 10 shots in a loaded mag. I would really like to trade them in for 3 of the old black mags, I have one old black 10 round 10-22 mag and 9 of the BX-25 mags, plus 6 very old clear/smoke plastic Ramline 50 round mags, all of which work great in both of my 10-22s fine. Bought this to show my son how ingenious the rotary mag design was. i have to force it to fit and then pop it out....black factory mag fits and drop free. Pretty pissed to have to spend time grinding down the sides of mag that is built FOR the Rimfire. . Not so ingenious.... Id contact Ruger and ask for a replacement...but who wants to deal with the hassle? Clear magazines are wider the original black magazines. They do not fit. Not sure why Ruger will not manufacture the clear magazines to original specs and sell those? The clear magazine is too wide. You can see the difference as compared to the original black magazines. I find it hard to believe that these out of spec clear magazines are being sold and actually advertised that they fit all of the models. Big disappointment that Ruger does not seem to care or want to make right. How hard is it to manufacture to the proper spec? I attended a couple of Appleseed events and everyone with the new 50th anniversary 10/22 had problems with these mags as I have had. They are simply too big to fit properly. The black mags are OK though. A shame since it is much easier to see the rounds when doing the mag changes required in these events. I bought one of these because of the ability to see how many rounds are in the magazine. One problem. They appear to be over sized. I tried them in an after market stock and they are a bugger to get out. Actually they really dont even seat all that well. The regular black magazines work perfectly with this stock. As a long-time Ruger customer from the 70s it breaks my heart to right a review like this. But here goes. I recently tried two of these clear 10/22 mags on an All American. To my surprise they are almost impossible to get out of the rifle. The OEM factory magazine that came with rifle just drops out fine. But the aftermarket mags are too wide and fail to extract without first pushing the mags out through the receiver. A search of Rugers magazine accessory lists customers with similar problems Some have measured clear errors in the size of the 10/22 mags. Unacceptable for Ruger to let something go like this. The quality is very good. I like being able to see the rounds left when I remove the magazine. The plastic is thick and durable. Easy loading. I have never experienced a mis-feed with this magazine during frequent use over the last year Ive had it. Worthy of the Ruger name.